Question | issue: I have a hole in my right earlobe from piercing that is lower than the left. I don’t want closure but just to move the hole up higher is that possible? Stretched earlobes and thinning skin can be repaired with Earlobe Plastic Surgery. With an earlobe hole that is moved lower from stretching, the best way to repair this is by excising and then closing it following this with another piercing. Otherwise to move it upward will require some type of incising and closing. Without fully closing it, you will need to do some flaps that could be more complicated than just closing it completely. 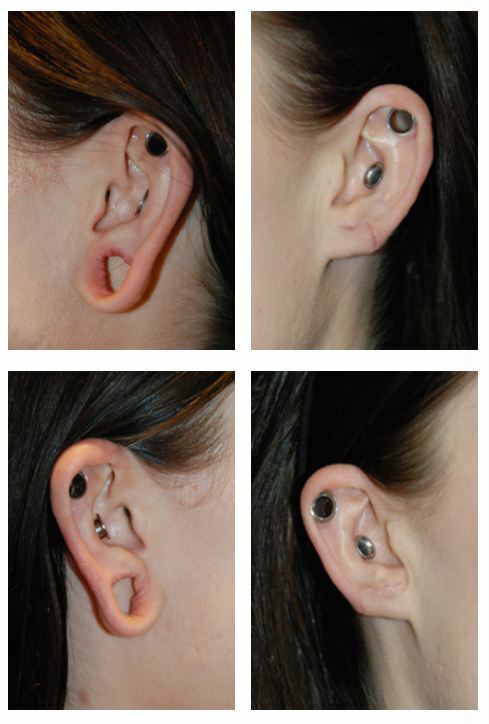 Below is a video demonstrating a earlobe repair for a earlobe that was gauged over time. The closure and movment of the ear lobe piercing would be a lot simpler than what the video will show but his is an example of how we approach working with the earlobe. Question: Earlobe Stretching and will they close on their own and do I need surgery for this? Stretched earlobes will not shrink and close on their own but earlobe plastic surgery will correct it. This depends on what was done and how long and how much the earlobe was stretched. It is very small like 1-2mm wide it could. But most likely you will need some surgical repair of the earlobe to make a difference. I prefer to close the hole completely and then repierce the ear at a later date, 3-6 months later. The surgery can be done under local or oral or IV sedation. We have a live video demo below and more information on our website! what to do about sebaceous hyperplasia which are single to multiple 1-3mm yellow umbilicated little pimple formation lesions. You can excise it or use cold therapy to take the lesion away with potential for scars. Also you can use oral isotretinoin with many risks including harm to the unborn fetus, dry skin, increase cholesterol, liver abnormalities, etc. Topical retin a has been shown to help as well. Laser Resurfacing are an option including pulse dye laser, 1450 laser and traditional erbium yag and co2 lasers work. One thing to rule out is basal cell carcinoma which can be mistaken for sebaceous hyperplasia. Posted in Laser Resurfacing, Reconstructive Procedures | Comments Off on what to do about sebaceous hyperplasia which are single to multiple 1-3mm yellow umbilicated little pimple formation lesions. It depends on what type of trauma it is. Many times, the trauma can cause a cut or laceration and sometimes when it is closed the multiple layers that the cut goes through may not be closed individually. This can lead to some layers not being properly opposed and hence a lack of tissue. The correction of this can entail reclosing the area in multiple layers to bring back the tissue. If it is due to volume loss from just the pure impact, you can graft fat into the area from your abdomen. If you don’t want to use fat, you can use other dermal fillers to do the same but not with the more permanent nature that fat can sometimes possess when done right. Another option is to transfer tissue from an adjacent area.